Avery, Kevin (2011). Conversations with Clint: Paul Nelson's Lost Interviews with Clint Eastwood, 1979 - 1983. Continuum Books. ISBN 144116586X. ^ Schickel 1996, p. 21. ^ guardian.co.uk Gentle man Clint, November 2, 2008. ^ Smith, Paul (1993). Clint Eastwood a Cultural Production. Minnesota: University of Minnesota Press. ISBN 0-8166-1958-1. ^ adherents.com The Religious Affiliation of actor/director Clint Eastwood. ^ CBS Evening News interview, February 6, 2005. ^ Locke, Sondra (1997). The Good, the Bad, and the Very Ugly – A Hollywood Journey. William Morrow and Company. ISBN 978-0-688-15462-2. ^ The King of Western Swing - Bob Wills Remembered. Rosetta Wills. 1998. p. 165 0-8230-7744-6. ^ a b Schickel 1996, pp. 51–55. ^ Schickel 1996, p. 50. ^ Reader's Digest Australia: RD Face to Face: Clint Eastwood Archived July 26, 2008, at the Wayback Machine..
^ Relive the thrilling days of the Old West in film | TahoeBonanza.com. ^ A Fistful of Dollars. ^ Frayling, Christopher (2000). 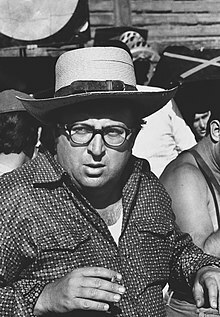 Sergio Leone: Something To Do With Death. Faber & Faber. ISBN 0-571-16438-2. ^ Kelly's Heroes, rottentomatoes.com; accessed June 16, 2014.